My h1 contains the text ‘WHY?’. The h1 is a 200px square absolutely positioned on the page. To create the semi-circle, I’ve given this element two background gradients: the first uses a linear gradient to draw two blocks of colour on the page: the upper block is solid parchment colour, whilst the lower block is transparent. You’ll see that I’ve defined the transparent colour as rgba(241, 236, 217, 0) rather than simply transparent; I found that using simple transparent gave me some ghosting, which is clearly not the intention. In each case, this draws a 100px-radius black circle, followed by an area of parchment colour. The lipsum content with the inverted red semicircle is coded in a similar way, although I could do away with the linear gradient, as my p tags give me the perfect hooks for a parchment-coloured background without worrying about gradients. 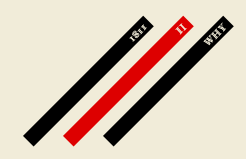 The text is shifted down with a simple padding-top rule, and the red line down the side is an equally straightforward border-right. The large red square doesn’t actually exist: it’s an :after pseudo-element on the body tag, which is then sized, positioned and rotated. I had to give it content(' ') to get it to appear, but otherwise it’s pure smoke and mirrors. These are then positioned absolutely on the page. 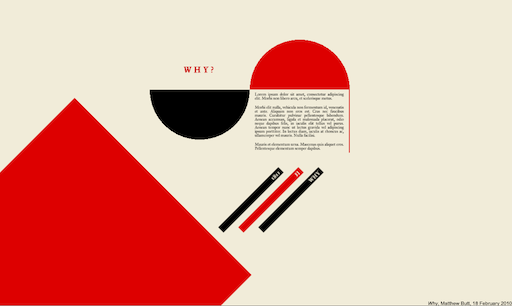 And that’s my piece of constructivist CSS for the day. I have one outstanding problem: the edges of my semi-circles are unpleasantly aliased. I’ve tried leaving a small gap between the colour stop points in the gradient to see if that helps, but the effect is pretty unsatisfactory. Any suggestions would be welcome! Previous Post Look mum: no images!